Traveling and living in Malaysia generally are quite affordable. However, as a student you will always be always searching for ways to save money. Here we share 7 money-saving tips which help to enjoy your life there too. Every student in the country can get Malaysian Student Discount Card (KADS1M) for free of charge. Using it you will be able to enjoy discounts on food, apparel, entertainment, books, health and recreation services, restaurants, transportation and even flight tickets. It saves from 5% to maximum 60% of your spendings at more than 2,600 different outlets. So don’t delay and apply for it. Many educational resources provided by many universities in Malaysia are available for free. Normally, you don’t have to pay for an access to their materials. So come to study at your university and use the Internet to research as much and as long as you need, instead of paying membership fees in public libraries. In addition, universities tend to organize free additional lectures, trainings and events. Don’t hesitate and attend them too. Malaysia, having a rich cultural heritage, which blends influence from Asia as well as Europe, offers many entertainments. And the good news here – you can enjoy many of them for free. First of all, you can always join free guided walking tours organized by the Kuala Lumpur City Hall. They highlight the local architecture, food, shops and history of Malaysia. There are many free galleries and museums as well. The most well-known ones in Kuala Lumpur are Bank Negara Museum and Gallery, Galeri Petronas and Wei-Ling Gallery. After all, simply come and enjoy peaceful spots at Lake Perdana at tropical Perdana Botanical Garden and KLCC Park. Also, every Monday at The Stage in Publika Square a free open-air film screening takes place. It is bound to be memorable. As a student, you can get tickets for some theaters, cinemas, clubs provide students with discounts. Even it is not stated anywhere, it never hurts to ask one more time. Cycling is the cheapest, but it is not that feasible and safe to ride a bike in Kuala Lumpur. 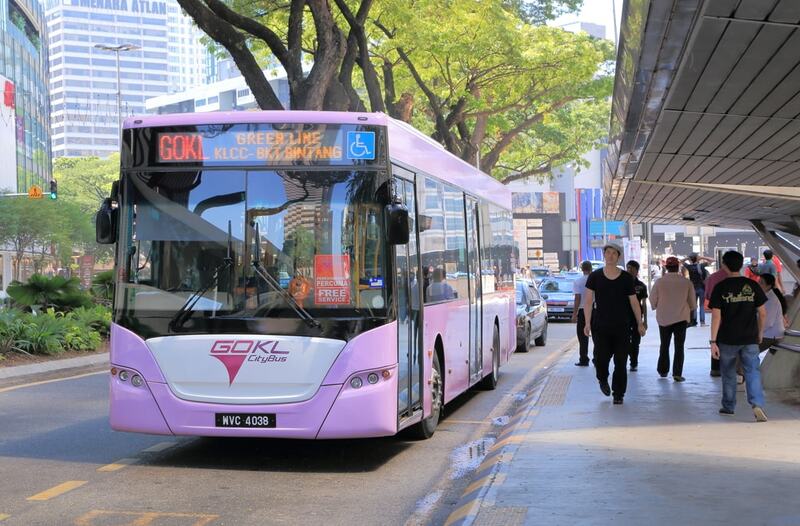 Free GoKL city bus service will be very useful if you travel within the Central Business District of Kuala Lumpur. It offers green, purple, blue and red lines, all of which have different one-route. They are free and quite convenient because bus stops are in very close proximity to tourist attractions, shopping malls and entertainments. In addition, you will find free WIFI network there. In you are staying or travelling frequently in Selangor, you should take the free Bas Smart Selangorku bus which covers all major destinations in Selangor. There are many other good choices for public transport: buses, trains, ferries, taxis. Buses, in general, are quite cheap. In case you are going to use the transport on a regular basis, better buy a monthly ticket for public transport, which costs only RM149 in Kuala Lumpur. When you need to take a taxi, pick Uber (UberX) or Grab (GrabCar) using discount promo codes instead. Besides cheaper price for a ride, it has many other benefits compared to the conventional taxi, which often doesn't use the meter. Moreover, when you are planning a round-trip journey to some neighborhood countries, like Singapore, for example, buy cheap bus or train tickets online in Malaysia. Otherwise, you will find out yourself that the same tickets outside Malaysia cost much higher. First of all, shopping in local street markets will save you a lot of money. In Kuala Lumpur there are plenty of them and the biggest are Petaling Street, Kasturi Walk, Chow Kit Market. You can find there various of very fresh groceries as well as apparel, accessories, jewelry and many other things for a quite cheap price. Moreover, they demonstrate the authentic Malaysian culture and serve as an attractive destination for tourists. Secondly, download a mobile application Smart Shopper. It compares prices for groceries across various supermarkets and provides you with the cheapest price just in a second. Finally, benefit of shopping during sales. Malaysia Year End Sale (November 1, 2017 - Dec 31, 2017). On these shopping festivals, you can shop with discounts up to 75%. Also, online shopping in Malaysia is growing and become especially popular. Go online and shop there using coupons on different products and services. Don’t forget to spend a minute before a purchase in an online store and check availability of one on the Internet. According to the Department of Statistics in Malaysia, almost half of the Malaysian population under 30 years old are bankrupts. As a usual thing, students have a difficulty with controlling their spending and waste much money on unnecessary things. The best solution to avoid this is to use cash instead. A credit card might be a good alternative only in a case when it is important. Otherwise, such habit may easily lead you to big debts. The thing is, it is hard to realize how much you spend when money is abstract. So plan your budget ahead and take as much cash as you really need. Everyone has certain difficulties with understanding where the edge between his needs and wants is. Sometimes, people tend to ignore its existence even if they realize it. This is how we buy impulsively and waste much money on unimportant things. Before making an actual purchase and spending money, especially a big amount, always take a minute to consider its necessity. Extra time will allow you to come up with an answer rationally and make a right decision.